In the annals of heavy metal history, perhaps no more deserving band has been more undervalued and overlooked than Saxon. The South Yorkshire quintet led by founders Biff Byford (vocals) and Paul Quinn guitar) were part of the big three of the New Wave of British Heavy Metal movement alongside Iron Maiden and Def Leppard. The former have gone on to become iconic metal legends, filling arenas around the globe, while the latter chose a lighter, but no less successful path. In the middle stands Saxon, every bit as powerful and influential a band. They have served as an inspiration for the Big 4; Metallica, Megadeth, Anthrax, and Slayer, as well as the likes of Pantera, Motley Crue, and numerous others. Over the course of four decades, Saxon has released some of heavy metal’s most enduring anthems, including “Denim and Leather,” “Motorcycle Man,” “Wheels of Steel,” “Power and the Glory,” and “Princess of the Night.” Byford’s vocals have become as readily recognized as those of Halford, Dio, and Dickinson, and it remains as powerful today as it did when the band dropped its debut album in 1979. 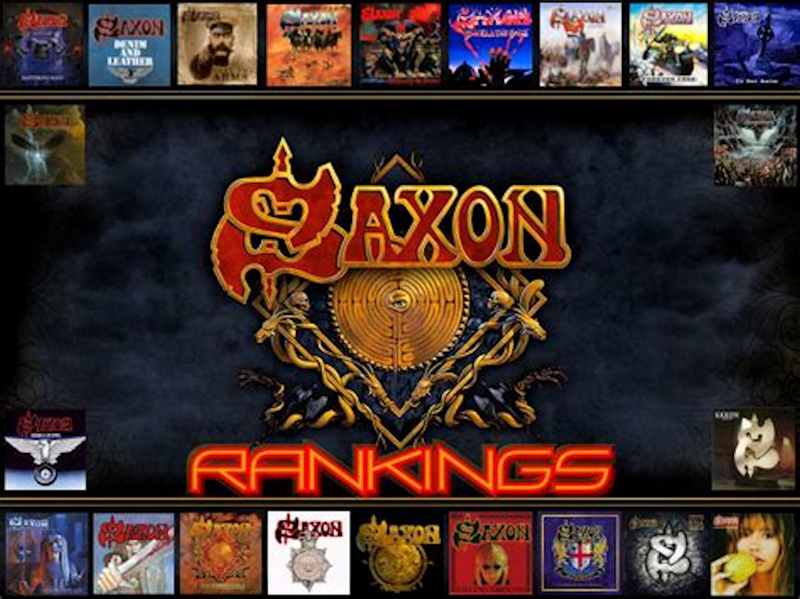 While many of their contemporaries have taken periods of hiatus or long breaks between records, Saxon has been as consistent in releasing new music as any fan could ask for. Moreover, the quality of Saxon‘s most recent albums like Sacrifice, Battering Ram, and Thunderbolt is as relevant and memorable as their 1980s heyday. This month, as we celebrate Saxon as our Artist of the Month, I have attempted to rank all 22 studio albums in the band’s weighty arsenal. It has been a rewarding few weeks delving back into the Saxon’s entire catalog. The band has built its own blueprint across four decades of recording. They’ve had a few missteps, but even on their worst day, they have few equals in terms of consistency and quality. So here is our list. Please sound off in the comments your thoughts and where you would have placed certain records on this list. No band records over 20 albums across 40 years without a stinker or two. Mind you, a Saxon stinker is still better than most band’s filler-fest dung heaps. That said, as the 80s were closing out Saxon felt like they were chasing a sound that was not their own. The fact that Destiny opens with a cover of Christopher Cross’ “Ride Like the Wind” should tell you all you need to know. Saxon went in a more pop-rock oriented direction attempting to cash in on the popular sound of the era. If Byford and company could get a mulligan I’m sure they would use it here. Saxon kick started the 90s with Solid Ball of Rock, an album that felt more in line with their light-alloy brethren in Def Leppard than with the ballsy riff-driven juggernaut they were known to be. The band found itself in the center of an identity crisis as so many metal bands of the era did. Grunge had classic bands scattering to acclimate to the changing tide of musical tastes. The album suffered from a lack of direction and cohesiveness, however it did shows signs of a return to the band’s signature sound. The addition of bassist Nibbs Carter, who wrote several tracks on the album, helped them dial back in. “Baptism of Fire” and “Alter of the Gods” are examples of the band’s return to their own style.